Whether you’ve heard a little about the best way to generate leads through the targeted automotive pay per click campaign and curious to learn more, or you already know that you want to use automotive PPC, but aren’t sure where to start. Your visibility is increased in a matter of seconds when you appear in the first page of Google, Bing or Yahoo! Automotive search engine advertising is one of the most popular forms of automotive PPC. It allows dealerships to bid for ad placement in automotive search engine's sponsored links when prospects search on a keyword that is related to automotive dealership’s offering. Paid search marketing is the fastest way to start generating traffic and conversions from the major automotive search engines. Appear on the top of every search results page, and pay only for ads on which a potential lead clicks. Save your time, efforts, and meet only potential buyers in your automotive website. You may spend thousands of hours waiting until someone click on your link through research. But it is grueling work especially if your automotive dealer website doesn’t appear on the top of the search. If you take the route of organic SEO ranking, it can take months or years for the search engine to give you the top spot on the automotive area. Every time your ad is clicked, sending a prospect to your website, you have to pay the search engine a small fee. When automotive pay per click is working correctly, the fee is trivial, because the visit is worth more than what you pay for it. A lot goes into building a winning automotive PPC campaign: from researching and selecting the right keywords, to organizing those keywords into well-organized campaigns and ad groups, to setting up automotive PPC landing pages that are optimized for conversions. We manage related keywords to ensure automotive dealership receives targeted traffic within their budget. Pay only for ads that work and bring a potential buyer to your site. This is nothing short of marketing perfection. Test the water and find out which products and services catch automotive buyers’ attention and which pages are the most interesting. Google gets great amount of traffic and therefore delivers the most views and clicks to your ads. Every time a search is initiated, Google digs into the pool of AdWords advertisers and chooses a set of automotive dealer websites to appear in the valuable ad space. The “winners” are chosen based on a combination of factors, including the quality and relevance of their keywords and ad campaigns, as well as the size of their keyword bids. How often your automotive PPC ads appear depends on which keywords, selected match types and your daily budget. While a number of factors determine how successful your automotive pay per click advertising campaign will be. Motorxloo works through continuous optimization, keyword analysis and constant improvement. 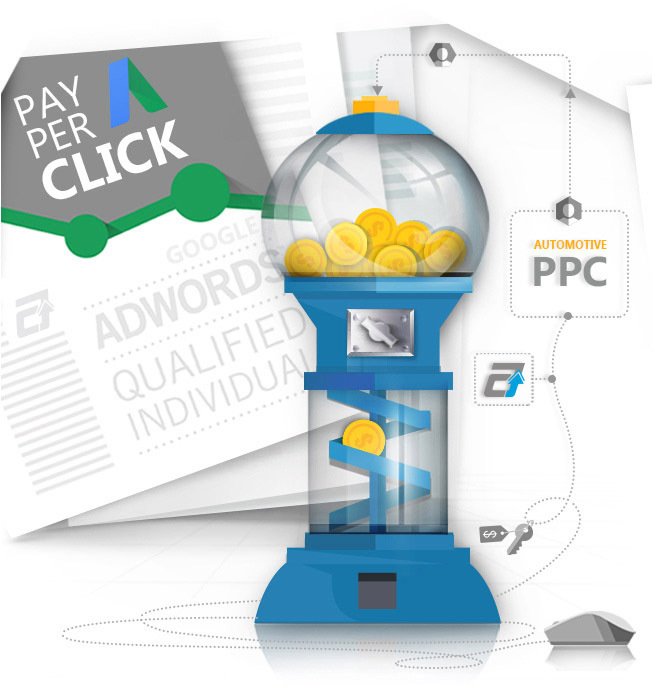 Our team is highly educated, experienced PPC specialists and aware of Google AdWords Certification. This ensures that we understand how to best structure your online ads and mobile devices. Let us show you our work, contact us.